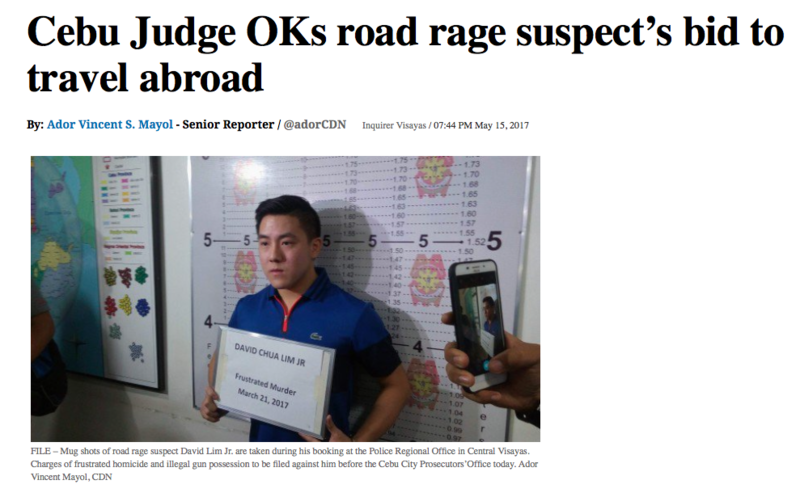 More proof that Duterte has certainly not ended corruption in the Philippines. Will we hear his thoughts on this egregious injustice? Will he toss this judge from a helicopter? A Cebu City judge has granted the request of Cebu road rage shooting suspect David Lim Jr. to travel abroad for a weeklong cruise with his family in the United States and Canada. In his order dated May 10, 2016, Judge Alexander Acosta of the Regional Trial Court Branch 9 found no problem with the suspect’s plea as long as he would return to face the charges against him. “The crime charged against herein accused is not among those that affects the interest of the national security, or public health, wherein the right to travel could be impaired as provided under section 6, article 2 of the 1987 Constitution of the Philippines,” he said. Before leaving the country, the accused was mandated to post a bond of P300,000 in court and to submit a certified true copy of his valid passport. Within three days after he returns to the country, Lim was ordered to personally report to the court. Acosta set Lim’s arraignment on June 16. Lim’s lawyers Gilbert Viloria and Conrado Sarmiento Jr. earlier asked permission from the court to let the accused join his family for a trip abroad. A year ago, they said Lim and his family already booked a cruise tour from Alaska, USA to Vancouver in Canada from May 29 to June 2, 2017. Lim and his family are set to return to the country on June 8. They said the family purchased airline tickets for their trip abroad in December last year. The request was opposed by lawyer Mundlyn Misal-Martin, the counsel of the victim, who earlier filed a motion for the issuance of a Hold Departure Order (HDO) against Lim. An HDO, she said, would ensure that the accused won’t leave the country to evade criminal prosecution, and to guarantee that he is properly brought before the bar of justice. Martin said Lim has not yet been arraigned, and if the latter leaves the country, he might be placed beyond the reach of the courts. “Without being arraigned, and much more that he is allowed to travel abroad, justice can never be attained considering the wealth and influence of his family, he can surely sustain himself in another country thereby leaving his victim without a chance at justice,” she said in a pleading filed in court. Lim earlier surrendered to Chief Supt. Noli Taliño, director of the Police Regional Office in Central Visayas, two days after he shot and wounded Ephraim Nuñal following an altercation along F. Sotto Street in Barangay Kamputhaw, Cebu City last March 19. He was charged with frustrated homicide and illegal possession of ammunition. The gun he used in shooting the victim was purportedly lost. Lim secured temporary liberty after he posted bail in court. I quote the article in full because the whole story is fully messed up. Killing citizens definitely affects public health. Why not let every criminal go on holiday abroad as long as they can pinky swear they will return to face justice. And as long as they can pay a few hundred thousand pesos bond. 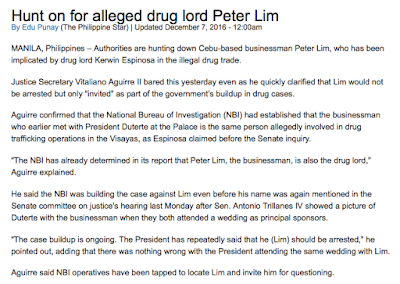 Could it be that the reason this alleged murderer is allowed to go on holiday is because he is the nephew of businessman and reputed drug lord Peter Lim? 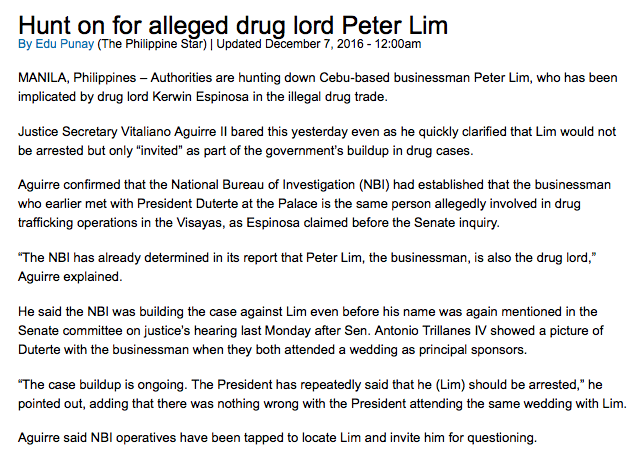 Does Peter Lim have the court in the palm of his hand? Drug lord or not, money talks and now this killer walks.